Heat oven to 350°F. Shape cookie dough into thirty-two 1-inch balls. On ungreased cookie sheets, place balls 2 inches apart. Bake 9 to 13 minutes or until edges are light golden brown. Meanwhile, cut each marshmallow in half crosswise with kitchen scissors. Remove cookies from oven. 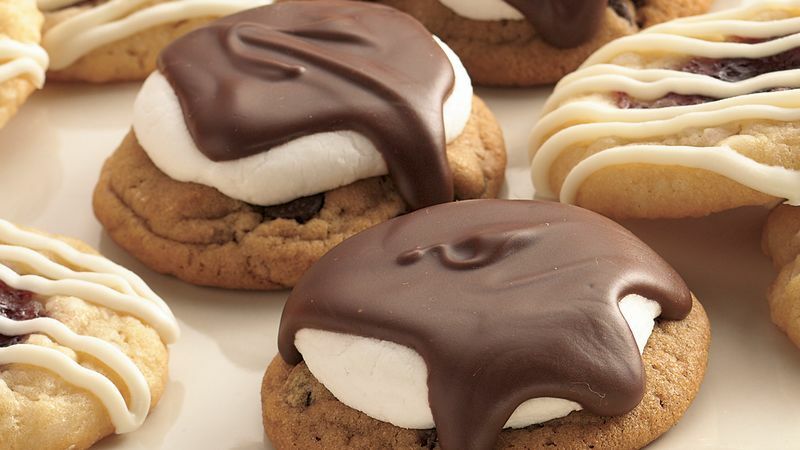 Immediately place 1 half marshmallow, cut side down, on top of each hot cookie. Return to oven; bake 1 to 2 minutes longer or just until marshmallows begin to puff. Cool 2 minutes; remove from cookie sheets to cooling racks. With fingers, gently flatten marshmallows. Melt candy coating as directed on package. Spoon about 1 teaspoon candy coating over marshmallow on each cookie, swirling with back of spoon to nearly cover marshmallow.